Coffee purists beware: This post explores coffee add-ins beyond a splash of cream or milk such as sugar, spice and everything nice — even butter and marshmallows! I appreciate (need, want, love) my morning coffee and keep it pretty simple at home. But when I’m buying a cup of coffee, I’m often tempted by flavors and exciting riffs on the traditional cup of Joe. So I started wondering what I can do at home to change up my predicable coffee routine. After a bit of research and some delicious experimenting, I’m happy to share my findings. Spices. Have you tired adding spices to the coffee grounds before brewing yet? Cinnamon and nutmeg are common additions but allspice, ginger or even a sprinkle of cayenne pepper are worth experimenting with too. Strong coffee flavored with cardamom is popular in Israel and other parts of the Middle East. 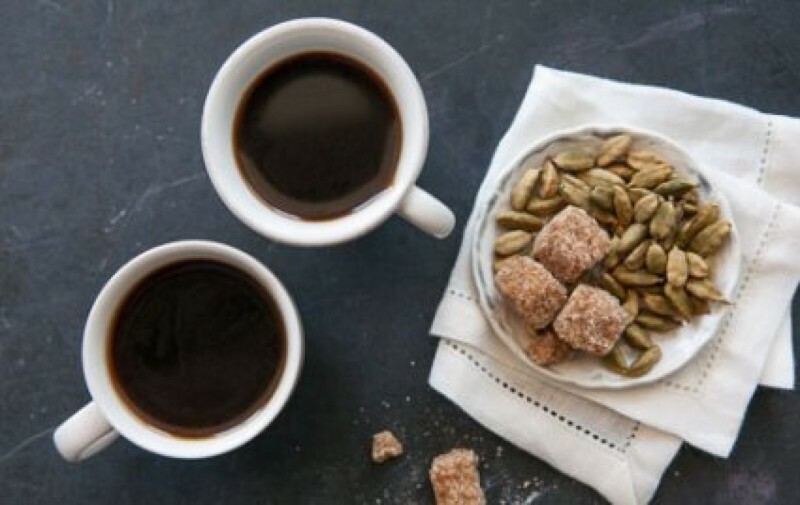 Learn how with this Cardamom Coffee recipe. Sweetened condensed milk. My perfect afternoon treat is a Vietnamese iced coffee made with strong coffee and a couple of tablespoons of sweetened condensed milk. So simple. So good. Vanilla/almond extract. Looking for a flavor booster that’s likely already in your fridge? Try adding a few drops of pure vanilla or almond extract and voila! Grass-fed butter. Recently it seems as if everyone is talking about this coffee addition inspired by traditional Tibetan yak butter tea. A recipe I’ve come across a few times suggests putting 1 cup of brewed coffee into a blender with 1 teaspoon grass-fed unsalted butter and 1 tablespoon coconut oil and mixing until frothy. Have you tried it yet? Non-dairy milks. Almond milk and coconut milk are available in varieties such as vanilla and chocolate. For iced coffee, I have been making cold-brew coffee (Learn to Cook: Cold-Brewed Coffee), then freezing it in an ice cube tray to prevent water dilution. When I’m ready for an iced coffee, I fill my glass with the iced coffee cubes and pour in almond milk. Whipped cream. It’s cream and sugar in one! Ice cream. You may have seen affogatos on menus at local coffee shop or cafes. It’s the perfect marriage — espresso and gelato. Sounds good, right? Try Coffee-Splashed Peppermint Ice Cream. Some variations also include whipped cream or a shot of amaretto or other liqueur. More! And that’s just the start. How about a touch of maple syrup or pomegranate molasses, a sprinkle of unsweetened cocoa powder or flavored sugars such as Vanilla Bean Sugar, marshmallows or liqueurs (for non-work days, of course). Blue Nile Blend. This blend of beans from Ethiopia, the birthplace of Arabica coffee, is a medium roast with intense berry and spice notes. As an extra perk, your purchase supports Girls Gotta Run Foundation, a non-profit organization that provides scholarships to Ethiopian girls. Organic Congo SOPACDI. This bright, crisp light roast with lime, green apple and blood orange flavors helps provide economic stability to the SOPACDI Cooperative, especially to female members to help them provide for their families. It’s fair trade and Non-GMO Project verified too. Café UBUNTU. With rich notes of golden raisin, maple and fig and a long sweet finish, there’s more to it than a satisfying cup of coffee. This light roast shares its name with a farm-to-table café and coffee shop in Maai Mahiu, Kenya. The café is a project of Comfort the Children International (CTC International), a non-profit that works alongside Kenyan communities to create sustainable change. In addition to creating jobs in the community, Café Ubuntu serves as a much-needed health and nutrition resource center for the Rift Valley and provides education to the community about sustainable farming. This entry was posted in Lifestyle and tagged Coffee, coffee add-in.